NYC is known for its pizza, and the NoMad neighborhood is no exception. 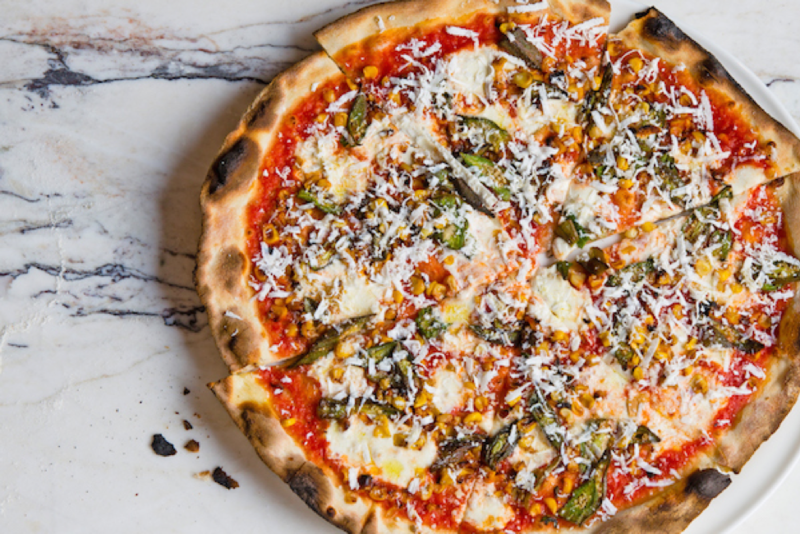 Whether you’re in the mood for a gourmet wood-fired pie or just want to grab a slice for lunch, here are a few great pizza places in NoMad worth a visit. Offering craft pizza with a twist, & pizza serves up a variety of tasty wood-fired pies made flatbread-style. Create your own pizza by choosing your crust, sauce, and toppings, or select from one of their unique signature combinations—such as &pizza’s “American Honey” (pepperoni, hot honey, and arugula) or “The Extra Helping” (short rib, mac & cheese, and pickled red onion). Stop in for lunch or dinner, or order online so your pie is ready when you arrive. Danny Meyer’s upscale pizzeria and Italian restaurant Marta is located at The Redbury New York Hotel. It is the brainchild of Chef Lena Ciardullo, drawing from traditional Roman influences to create unique taste combinations for his thin-crust pies. Pizza offerings range from traditional Margherita to unique combinations like the Autunno (sweet potato, kale, pecorino, and fontina) or the Casino (clams casino, bacon, béchamel, provolone, and baby kale). You can also choose from a variety of salads and Italian entrees grilled over an open flame. One tip: Marta is a non-tipping restaurant, so hospitality is included in the price. Monday – Friday: 12 p.m. – 11:30 p.m.
Saturday and Sunday: 11 a.m. – 11:30 p.m. In the New York tradition of the 99-cent cheese slice, this counter-service pizzeria is a great place to stop in for a traditional slice on the go. It offers a wide range of pizzas available either whole or by the slice, along with alternate quick specialties like pepperoni rolls, garlic knots, knishes, or beef patties. Famous also delivers via the Slice app. Monday – Sunday: 10 a.m. – 11 p.m.
Locally-owned and operated, Waldy’s offers an excellent variety of artisanal wood-fired pizzas at surprisingly affordable prices. Signature pies are available in small (essentially 1/2 pies, or two slices), medium, or large. Waldy’s also offers a selection of salads and wood-roasted penne dishes (such as its version of mac & cheese). Waldy uses locally-sourced ingredients when possible, and offers online ordering and delivery. Monday – Sunday: 11 a.m. – 11 p.m. Here is something special — some of the best pizzas in NoMad in one of its most romantic spots. This is the perfect place for a date. Of course, Bread & Tulips offers a full menu of Italian dinner favorites, all of which are delicious, but their pies are brick-oven beauties. Our favorites here are: Quattro Formaggi (mozzarella, grana, fontina, gorgonzola, caramelized onions) and Hen-of-the-Woods Mushroom (taleggio cheese, red pepper flakes, arugula). Monday, Tuesday and Wednesday: 11:30 a.m. – 9:30 p.m.